You’re not suppose to feel remorseful for a murderer, right? I’m asking for a friend because I’m not so sure my sense of judgement is okay after this stupidly addictive book. 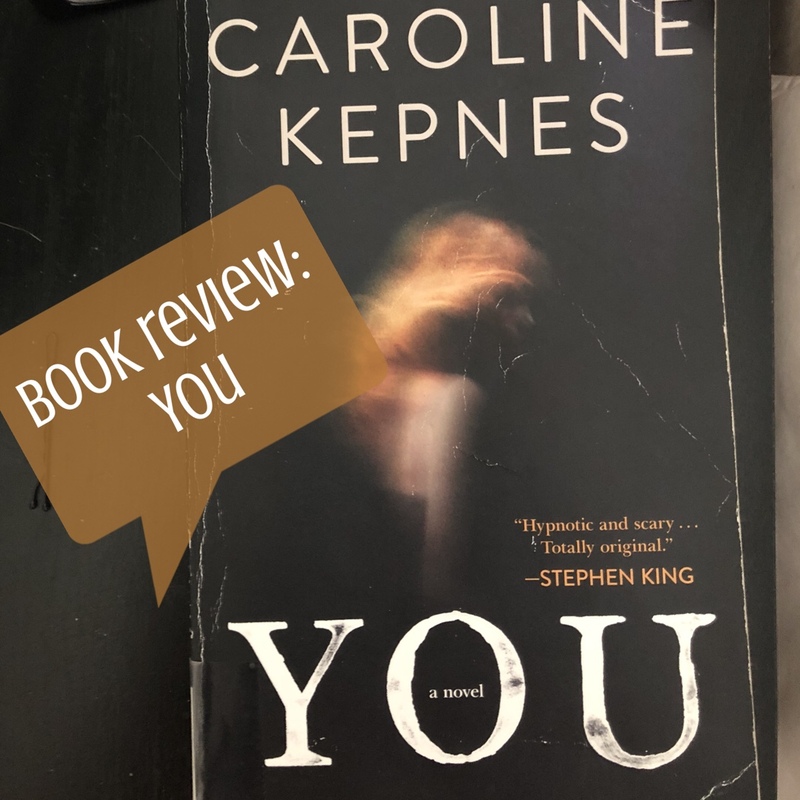 In You by Caroline Kepnes, we are introduced to Joe Goldberg, a bookstore clerk who meets aspiring writer Guinevere Beck. There’s some sort of chemistry, or maybe it’s the fact that Joe begins his obsession with Beck by googling her name off of her credit card, just like any normal person would. He learns that she’s a student at Brown University, lives alone on Bank Street and tweets mundane things like her exact location and itinerary for the night. Call it fate, or call it paying extremely close attention to detail when they end up at the same bar that night. Joe is willing to do whatever it takes, (and I mean whatever it takes, like stalking her to a Charles Dickens festival or even scheduling sessions with her therapist to learn why she sees him) to ensure that he’s the perfect man for Beck. He literally infiltrates every aspect of her life, forming and molding himself into the perfect boyfriend. He swoops in to pick up Beck’s broken pieces when an array of weird circumstances unfold, like her loser ex-boyfriend and best friend, who is not-so-secretly in love with her, end up dead. Coincidence? Or strategic murder? There’s a ton of satirical humor peppered throughout, enough to make me either chuckle or actually laugh out loud. The humorous bits don’t make you constantly feel as if you’re reading a thriller, which can be pretty damning to your psyche and Kepnes does a great job of balancing the two. If anything, the humor helped give it such a high score. What can I say, I love a good twisted comedy! In the current age we live in, it’s easy to see how this could be absolutely terrifying and could potentially happen to people. We are wrapped up in our internet lives and we share information that could be an invitation to let someone, like a Joe, into our lives. This story is demented because it shows you the lengths a person can go to just to prove their love and affection, and how love can literally make someone so sick in the brain that murder is an absolute justification to show how serious they are about a person. It’s even more deranged because you genuinely start to feel bad for Joe! Why can’t Beck just love him and give him the time of day?! Why is she so self-centered and not realizing what a great guy Joe is?! Forget the fact he’s willing to go the distance, which might even mean murdering somebody, he’s a great guy and means so well! As you read this story, it messes with what you know is right and wrong and makes you question your own sanity, so major props to Kepnes for being able to do that with her writing because I have yet to find an author who can execute both so well. As a long-time fan of Dexter (& don’t even begin to get me started on the finale because I’m STILL tight about it…), I felt that Joe and Dexter Morgan could have been great friends. They’re both lovable murders and main characters that you feel sympathetic towards, yet, you know that they’re suppose to be the ‘bad’ guys, because killing people, if even semi-justifiable, is still wrong and you probably shouldn’t do it. Hidden Bodies is the second installment of this series and it’s already on my To-Read list. I’m interested to see what kind of predicaments Joe can get himself in and out of and if the humor is similar to You, I know I’m already going to be a big fan. This entry was posted in book reviews and tagged #blogger, bbloggers, beauty blog, blog chat, blogger girl, blogger life, blogger lovin, blogger style, bloggers, blogging, blogging gals, blogging tips, book haul, bookgram, books, books and tea, bookshelfie, bookstagram, booktography, caroline kepnes, fashion blog, fbloggers, good reads ​, humor, instabooks, life with sarah ​, lifestyle blog, murder, mystery, on the blog, reading challenge, reading corner, sarah lokker, sarahhlokk, savvy blogging, story time, yalit, you. Bookmark the permalink.